How many logo options should I present? Hello! I have been hired to design a logo for a company and I have come up with several ideas but I’m not sure if presenting too many options could possibly be a bad thing. I was thinking I might present 5 options. Is this too many? Or is there no such thing as too many options? I don’t have much experience with this so any advice would be very helpful. Thanks! Rather than directly answer the question I want to present two sides to this question and then allow you the reader to choose the option you feel works best for how you operate. When we as creative professionals ask a client to choose from multiple logos we have now put the decision on the client. The role of a creative professional is to use your expertise and knowledge to make decisions on behalf of the client that will move them towards their primary goal. Of course, we want to include we client in the process however we have to think about making things easier for the client and if we present them with a choice that choice is not often easy and reduces all of the work that we created down to their preference instead of the business goals. We have to remember that we are not only serving the client but we are also serving the clients customer. So if we have created multiple logos and we are unsure of how to present them to a client we have to discover which of the logos we created resonates the most with the clients target audience. Tropicana orange juice is known for having a carton with an orange that has a straw in it. 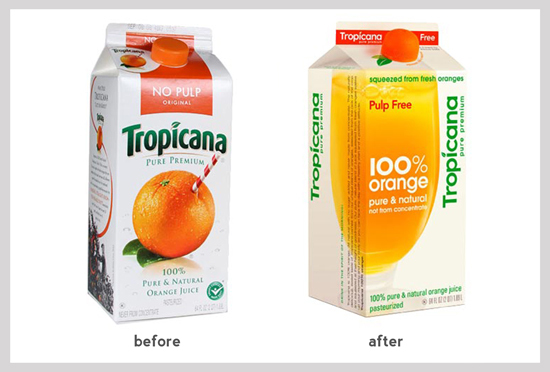 Tropicana wanted to update their packaging to the Modern Age, so they decided to change the style of the orange juice carton. The executives noticed that sells drastically dropped and when they looked into the problem, they discovered the box design changed so much consumers assumed that the product wasn’t in the store, therefore, they bought a competitor’s orange juice cuz they thought the store was out of stock. After changing the car in back to how it initially was cells returned to where they were. This is a prime example of how someone’s preference is not the best if it doesn’t accomplish the primary business goal. We can use services like Usability Hub to run a preference test or to take a survey of the target audience and get feedback and data to show why we might have chosen one logo over another. If nothing else if we have multiple logos to present and would not sure which one is the main one we can use the logos to explain how we arrived at the primary logo we believe is the best one. There’s another approach taken by Sarah Dayan and Sean McCabe called the One Concept Approach. In this approach, only a single logo is presented to the client. Keep the process of a logo about solving a business problem and meeting a goal.